You can use anything around you to stimulate and boost a child’s speech and language skills. Sometimes the simplest, like a ball, is the most beloved. That is the basis for Playing With Purpose. I help you look at what you have and explore how you can adapt it or tweak your play for language stimulation. I was recently surprised while shopping for a birthday gift for a friend’s one-year-old; it was overwhelming! Going into the store, I knew I wanted to buy a battery-free toy that aligned with his development. As you have read my Playing With Purpose series, you may be under the impression that you need to spend a lot of money to support speech and language development. Today, for example, I bring you a staple toy that is low cost and you may already have lying around! In homes and in clinics across my years as a pediatric speech therapist, I’ve spent many sessions playing ball with children. Balls are simple yet engaging, and they are enticing and fun for kids of all ages. Before I dive into my PWP tips, I wanted to share a tip or something to consider when buying a ball. Whether you are buying this toy for your child, a child you know, or for your pediatric speech therapy practice, consider something very soft (preferably made of foam). Kids like to throw balls, and the last thing I want to happen is for your great aunt’s antique vase to get broken. Or for you to wind up with a broken nose. Trust me; you will get hit in the head one day as you PWP. If it’s the right time of year, you can likely find a beach ball at your local dollar store which is another fun option. 1. Use a ball to teach turn-taking. You can begin this with a child when they are young and just starting to sit up on their own. Get down on the floor and have your child sit in your lap. Then have another caregiver sit across from you. Help the child push/roll the ball to the person across from them. Continue back and forth as long as your child is enjoying the game. Again, this is setting up what is known as “serve and return” or reciprocal play. It is a foundational skill children must learn that will later help them engage in conversational turn-taking. 2. Add a choice element to play. Once your child has begun to roll the ball back and forth with you, ask them, “Should I roll the ball or bounce it?” You may offer a choice that involves the people in the room by asking, “Should I roll the ball to you or mom?” When you are outside, you can add in choices such as throwing, hitting or kicking the ball. The child then has an opportunity to choose how they want to return or move the ball next. Making choices during a fun activity will help your child develop decision-making skills and will help build their sense of responsibility. 4. Integrate the ball into target sound practice. Children develop vowel sounds first and later, the sounds we make with our lips. Those are the sounds the letters P, B, and M make. You can encourage production of these sounds by naming words with a certain sound as you play ball with your child. Work on the /b/ sound with words like ‘ball, bounce, bye-bye, bump.’ You can work on the /p/ sound using the words ‘pat or push’ and the /m/ sound for ‘more, me, my ball, and my turn.’ The words ‘kick and catch’ are also good vocabulary for playing with a ball and help with another early developing sound, the /k/. 5. Balls can be used to facilitate a question and answer game, specifically answering WH questions (i.e., who, what, when, where, why, and how) during listening or reading comprehension work. Each color segment on the ball can represent one question. You can write the questions directly on the ball with a permanent marker or have a chart to use as a key. After the child reads or listens to a passage/story, you throw them the ball. Whichever color their right thumb is on when they catch the ball, indicates which question they will answer. I also love this idea for PWP with a ball from fellow speech therapist blogger Crazy Speech World. 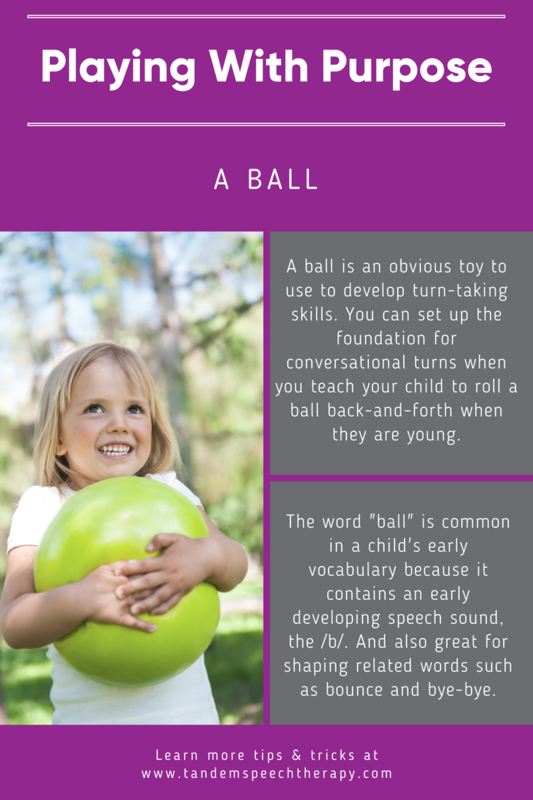 Do you have other fun activities to play with a ball that have helped your child or a child you work with build their speech and language skills? Share with us in the comments below!